Rumors that Steven Spielberg's secret EA project was hit particularly hard by recent cuts at the company were confirmed, denied and ignored before someone finally admitted that only a "handful" of people are still on the project. EA announced last week that six percent of its workforce would be laid off as part of cost-cutting measures being implemented in response to the company's growing financial losses. The following day, according to videogaming247, rumors began swirling that the cuts had left the Spielberg project, codenamed LMNO, without most of its personnel. In response, EA issued a statement to Kotaku saying the game is still in development at EALA, "under the creative leadership of Doug Church and Lou Castle. The rumor is incorrect." Perhaps tellingly, VG247 received the same statement but with the last line - the one about the rumor being incorrect - missing. Eurogamer also received a statement from an EA rep which at first apparently claimed the rumors of cuts to Spielberg's project were "categorically not true," although that article has since been changed to reflect the tone of the other statements, and now claims only that rumors of the project's cancellation are untrue. Finally, when asked point blank over the weekend whether LMNO team members were being cut, EA's bottom-line response was a firm "no comment." "We are not providing detailed numbers on a per location basis," the company said in a follow-up statement. "We have only said that the action impacts approximately 6 percent of our workforce worldwide." But VG247 claims, "for the record," the staff cuts to the Spielberg project did in fact happen. "The majority" of the team, including senior members, were cut from the team, leaving only a handful behind, including Creative Director Doug Church and Executive Producer Lou Castle. LMNO is the second game being developed by Spielberg and EA as part of a three-title deal first announced in 2005. 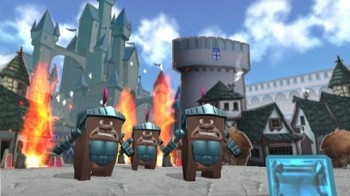 The first game to come from that deal was the Wii puzzler Boom Blox; LMNO is "a contemporary action-packed adventure" for the PlayStation 3, Xbox 360 and PC that puts players in the role of an ex-secret agent in the company of a computer-controlled female accomplice, which Newsweek's N'Gai Croal described as "North by Northwest meets ET... if ET were female, grown up and hot."